GnomeDX is a molecular biology CRO providing services in a CLIA lab environment. GnomeDX can provide clinical trial and other research support services for the pharmaceutical, biotechnology and medical device industries, including government institutions, foundations and universities. Gnome is pleased to offer the research community laser capture services. Laser microdissection (LM) is a microscope-based technique that uses a laser to isolate specific groups of cells, individual cells, or cell organelles, from embedded, frozen or fresh tissue sections. Gnome utilizes the Zeiss PALM Microbeam IV which is the only laser microdissection system that can be used reliably for individual experiments as well as highly automated workflows. Both routine systems and tailor-made configurations are available, meeting the most specialized needs. In LCM biological material is placed on a glass slide, or equivalent surface, and a thermo-plastic membrane is placed in direct contact on top of the material. The laser beam source is positioned below the material and the beam is focused through a microscope ocular lens onto the biological material on the slide. When the laser beam strikes the material, it is blasted off of the glass surface and melts onto the thermo-plastic membrane. The thermo-plastic membrane piece containing the blasted material is then physically isolated and the material collected. In LMPC the biological material is placed on a polyethylene napthalate (PEN) membrane covered glass slide. The laser beam source is positioned and focused as in LM. A tightly focused laser beam is used to cut the PEN membrane and the material. A defocused laser beam is then used to "pressure catapult" the cut membrane with cells into a sample collector. The major advantages of LMPC over LCM are the increased amount of tissue captured in a given time, preserved cellular integrity, and the biological material is obtained without direct user contact and contamination free. LMPC enables capture of biological material ranging from defined multi-cellular tissue elements to specific sections of cells and organs to cellular organelles. GnomeDX can determine the genetic variation in your samples. GnomeDX offers a set of validated assays and also provides validation services for additional assays of interest. Validated assays/panels for the following genes: APO E	CYP3A4, FKBP5, MTHFR, CYP1A2, CYP3A5, GRIK4, SLCO1B1, CYP2C9, COMT, HTR2A, UGT2B15, CYP2C19, Factor 2, HTR2C, VKORC1, CYP2D6, FV Leiden, ITGB3. Custom assays/panels: GnomeDX can provide validated genotyping services on client's genomic targets of interest. GnomeDX can determine the copy number of individual genes in your samples. GnomeDX offers a validated CNV Assay for CYP2D6 and can also validate any additional genes of interest. Validated CNV assays: CYP2D6 > RNASE P. Custom CNV assays/panels: GnomeDX can validate your gene of Interest. Flaws in the identity and quality of biorepository specimens produce misleading experimental data that cost research labs millions of dollars in wasted resources, and in some cases to erroneous publications that damage reputations. GnomeDX can determine that your sample set consists of unique individuals. Cost-effective sample verification with a panel of 96 SNPs for biorepositories and research study samples. GnomeDX can help you detect somatic mutations in genes associated with cancer research. 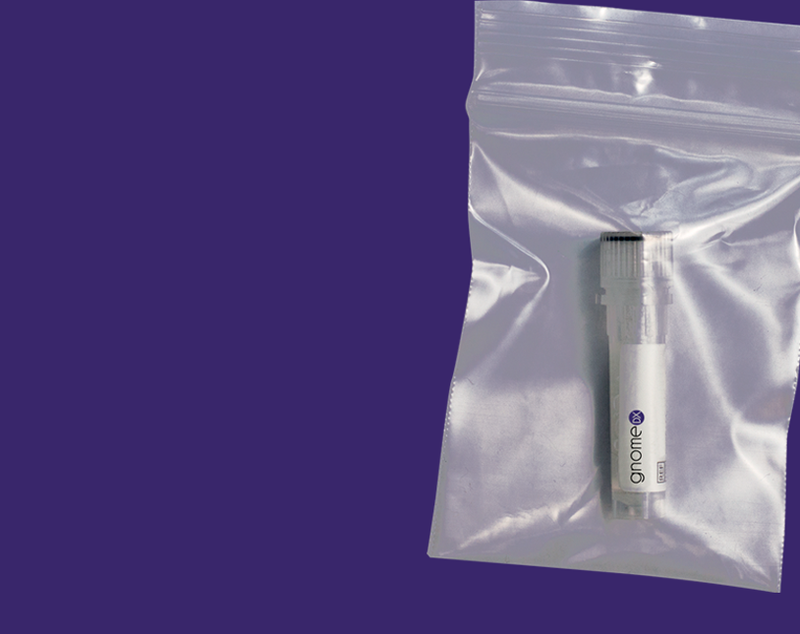 GnomeDX can isolate Nucleic Acids from your samples for downstream processing. Our Nucleic Acid Extractions can be combined with sequencing, GWAS arrays, panels, or custom content products to provide you with an end-to-end solution for your study. GnomeDX can determine the gene expression in your samples. GnomeDX can determine gene expression differences in your samples with Real-Time PCR. GnomeDX can provide gene expression services on client's gene expression targets of interest. Custom panels of validated assays (Taqman). Tumor gene expression has proven effective in measuring immune response during cancer progression and therapeutic response. GnomeDX can provide gene expression data on a select panel of genes representing tumor and immune response. Custom Panel of 170 genes, including 5 house-keeping genes.